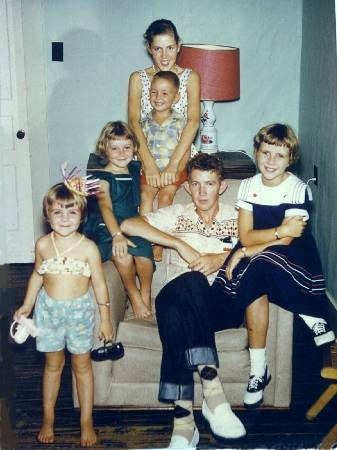 In this photo I was 18, Jeanne was 17, Brenda was almost 11, Marinelle (at my right elbow) was 9, Sherrye was 6, and John was 5. 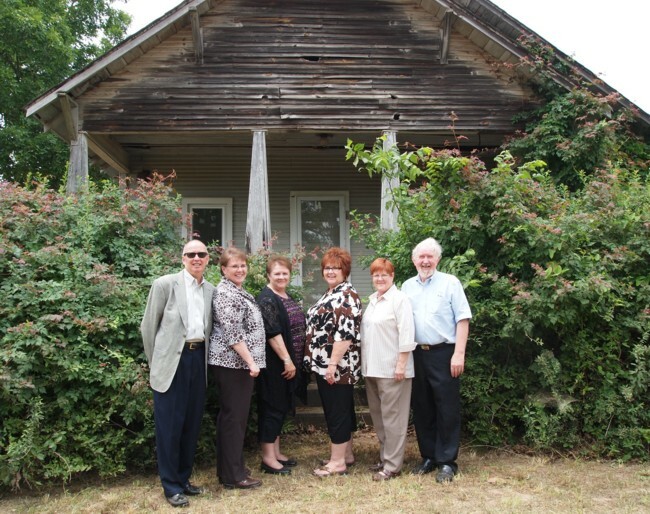 We were in the northwest corner of our living room in Cleveland, Arkansas. Uncle Irving took this slide. This is probably the first photo of the six of us. 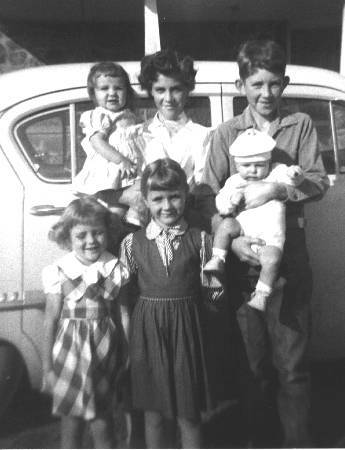 I was 13; Jeanne was 12; I was holding John , who was a few months old; Jeanne was holding Sherrye, who was one year old; Marinelle was 4; and Brenda was almost 6. The photo was taken with the old Spartus Miniature. Momma probably took it. We were standing by the 1953 Plymouth Cranbrook which was parked by the front steps of the house. 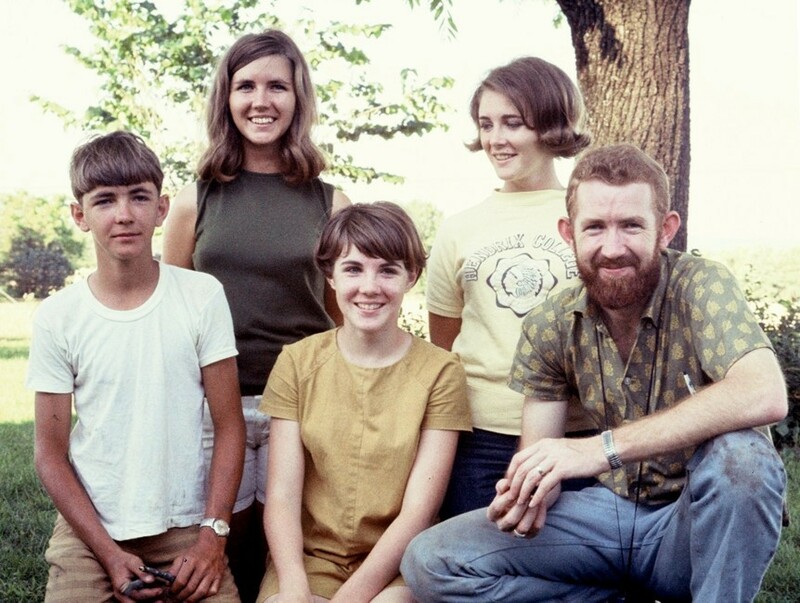 Here are five of us by the old walnut tree at home in the late '60s. By March 1979 we were grown? 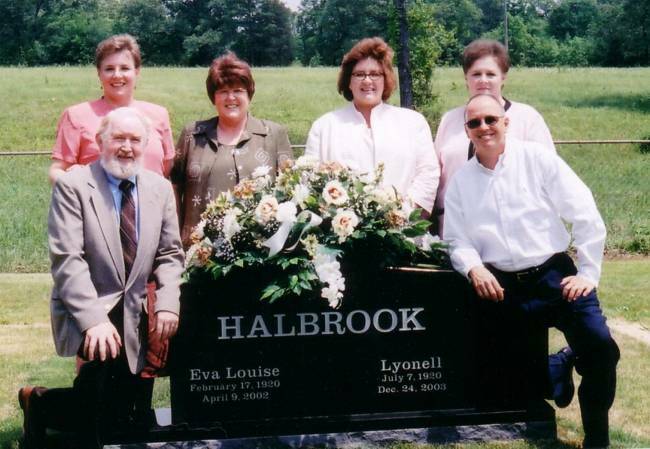 From left to right, top to bottom, I was 38; Jeanne was 37; Brenda was a little over 30; Marinelle was almost 29; John was almost 25; and Sherrye was almost 26. 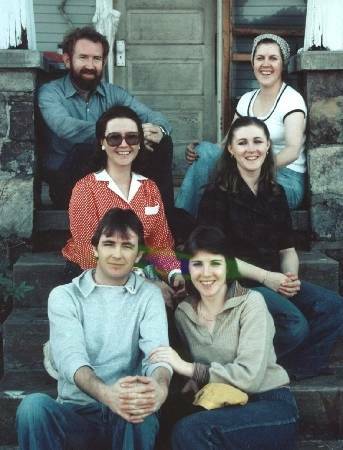 We were sitting on the front steps of Grandpa Maxwell's old house near Lanty. I set the exposure settings and decided on the distance; then Ann framed the shot and pushed the shutter. This photo was on Kodachrome. We also shot one on B&W film using another 35mm camera. This image was scanned from an 8x10 Cibachrome print that I made from the original slide. At John's wedding in December 1980.
at Old Liberty Cemetery on Mother's Day 2004. This was the first Decoration Day since both Mom and Dad had died. Luther Alonzo Maxwell and Eugenia Frances Houston Maxwell.